Arctic Council members met in Moscow this week, and experts agree that Russia’s growing rift with the West has not put a stopper in on-going cooperation to protect the Arctic. But increasing tension could jeopardize the project – and the future wellbeing of the threatened area. Finland will assume the two-year rotating chairmanship position of the Arctic Council, an intergovernmental forum addressing sustainable development and environmental protection in the Arctic, in May 2017. The council was founded two decades ago and includes the countries of Iceland, Canada, Norway, Sweden, Finland, Denmark, Russia and the US, along with 12 additional observer countries that include China and India. In addition, six organizations representing Arctic indigenous communities and other Arctic inhabitants are permanent participants. 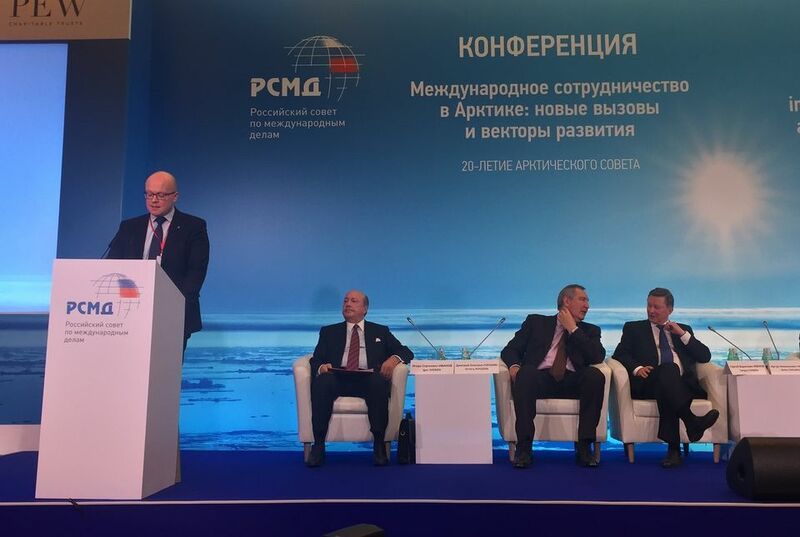 Moscow hosted a conference on international cooperation in the Arctic October 12 and 13, an event organized by the Russian International Affairs Council with support from the Russian Foreign Ministry. Counter to expectations, climate experts and politicians lined up to praise international Arctic conservation efforts at the conference, amidst signs that Russia and the western world are undergoing a crisis that some say surpasses the Cold War era. The Syrian war has exacerbated relations between the US and Russia, causing many bilateral cooperation agreements to founder. For example, last week Russia dropped out of a plutonium agreement to mitigate the spread of nuclear weapons. But cooperation to address Arctic concerns continues among the bordering states without strife. During the United States’ term steering the group, work to conserve the endangered area has even been seen as gaining ground. Progress has been made in the fight against climate change by calling more attention to so-called black carbon, which settles on snow and ice in the Arctic region and intensifies melting of the polar ice cap. In addition, the Arctic Council has stepped up maritime cooperation and been instrumental in the foundation of an Arctic Coast Guard forum. “After the accession of Crimea and in the midst of the Eastern Ukraine crisis, cooperation has only become closer. It is a paradox of its own that during the US term of chairmanship, there has been a clear increase in the amount of Arctic cooperation,” says Timo Koivurova, director of the Lapland University’s Arctic Centre. After the events in Ukraine, each of the Arctic Council members introduced economic sanctions against Russia, and Russia then responded with counter-sanctions. Western sanctions on oil exploration and an embargo on production technology interfere with Russian activities in northern waters. Limitations on financial sector activities also hamper Arctic protection, a goal that Russia has proposed be made priority as part of next year’s environmental focus. “In terms of Russia, the sanctions have meant that environmental investments with international financing have been frozen, with no change in sight,” says Hannele Pokka, leader of Finland’s Environmental Ministry’s environment section. Western countries are also wary of Russia’s recent moves to increase its military presence in Arctic areas. Russia has re-opened some of its Soviet-era bases and launched new ones in region. Moscow has also stepped up military exercises in the Arctic. Russian experts claim that this enhanced activity is primarily meant to increase security, improve readiness for search and rescue tasks and environmental catastrophes, as well as preparing for military threats. “There’s no reason for a conflict to develop in the Arctic region, but fear from both sides could potentially develop into the greatest threat. These fears could provoke the parties into an unwanted situation and behaviour,” says Andrei Zagorski, a researcher with the Moscow State Institute of International Relations. Zagorski says it’s very important that Russia and the US strive to keep up an active dialogue in the Arctic Council, despite deterioration elsewhere. Finland will take over stewardship of the Arctic Council from the U.S. next year in May. Finnish President Sauli Niinistö has earlier suggested that during its two-year term at the helm of the council, Finland could perhaps allay the world’s political situation by hosting a summit – with the leaders of Russia and the U.S. in attendance. Finland will in any case assume a vital position as head of the council to ensure northern cooperation continues. “Finland can help to ensure that nations such as the United States and Russia continue their positive dialogue. The Arctic Council is one-of-a-kind in that we identify our common interests and take action together to act on their behalf,” comments David Benton of the United States Arctic Research Commission. This story is posted on Independent Barents Observer as part of Eye on the Arctic, a collaborative partnership between public and private circumpolar media organizations. How many observers can Arctic Council handle?